I've been so excited to wear this sweater/shirt since I snagged it at the Nordstrom Anniversary sale! The weather is finally getting chilly enough for it, and I must say I'm SO glad I got it. 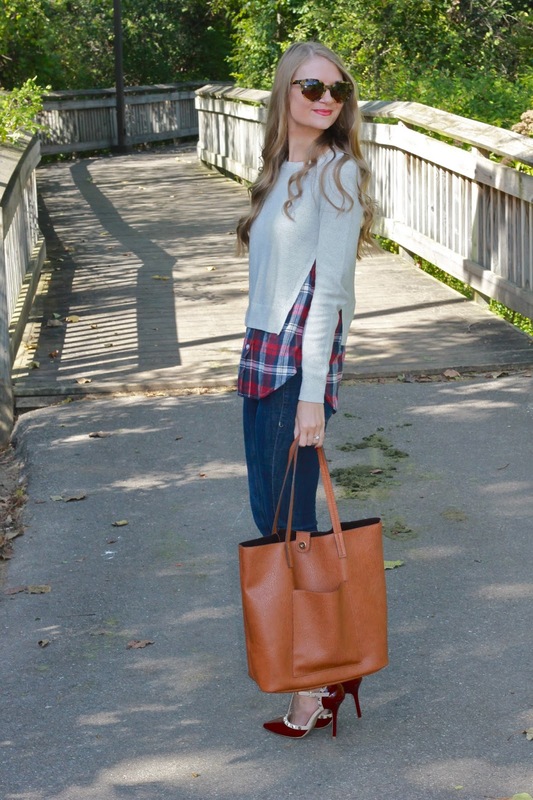 You could recreate a very similar look with a plaid shirt like this and a sweater like this or this. There are also many similar ones available now. I love layering in the fall, and sometimes it is nice to have the layered look without the bulkiness, especially at the beginning of fall (before you really need the warmth). Also, right now there is an amazing Tory Burch sale going on. You can save up to 30%! If you spend $300 you get 20% off, if you spend $500 you get 25% off, and if you spend $750 you get 30% off with code 'FALLEVENT'. This is the perfect time to get a great pair of boots or a bag for fall! My favorite OTK boots from last year are included in the sale! I'm off to Wisconsin for the weekend with the fam for my grandma's 90th birthday celebration. Hope you all have a wonderful weekend! TGIF!